Niagara Falls, NY - Seniors hit the road as part of the 2nd Annual Niagara Elders Exercise Loop walk around Hyde Park. N.E.E.L, Is a one mile path through Hyde park that is marked with 4 different senior citizen based exercise stations. Leading the pack are Carole Dunn and Anna Jean Pietrangeli. After the walk the seniors were treated to a health fair and lunch. 2ND ANNUAL N.E.E.L. 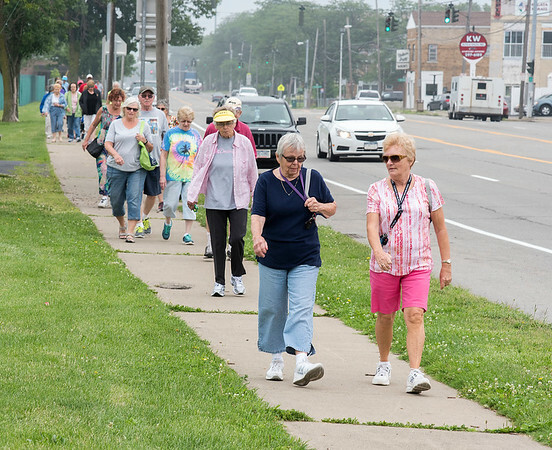 WALK DAY FRIDAY JULY 12TH 8:30-12:00 The N.E.EL., Niagara Elders Exercise Loop Is a one mile path through Hyde park that is marked with 4 different senior citizen based exercise stations. Come and enjoy a beautiful walk through Hyde Park. Warm up with Bob White, enjoy a walk through the park, try out The N.E.E.L., grab up lots of information and goodies in our infamous health fair and top it all off with lunch! And remember this is a FREE event. So come and give it a try, what do you have to lose? A relaxing warm up, an invigorating walk, free stuff and lunch, sounds like a win-win to me!